This burnt orange/rust colour is so popular right now and I love it! 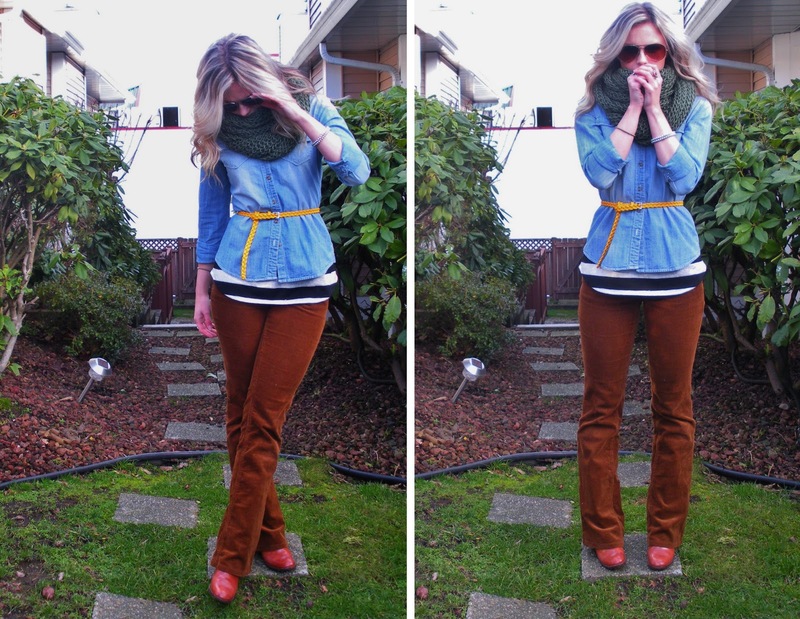 In the form of boot cut, corduroy pants they remind me so much of the 70’s.This 70’s inspired fashion has been popping up for the last few seasons. This is my take on the trend! In addition to the color of these pants, I also love the cut.Even though skinny jeans are almost all you can buy when shopping for denim, I feel like the boot cut is much more flattering for most body types.I wore mine with a low chunky heel that is comfy enough for a full day of walking.Boot cut jeans paired with mid heels are a staple for celebs like Jennifer Aniston which is PART of the reason she always looks so long, lean, and fit!Don’t we all strive to look as good as Jennifer? I know I do. On another note, I am still desperately holding onto the last little bits of Christmas.Christmas always comes and goes far too quickly for my liking. So, I am off to bake gingerbread cookies now!Now that I think about it, these are actually the perfect gingerbread making pants because if I manage to get dough on myself (and I know I will), it will blend right in!No one will ever know!Except those who read this, of course…..
Wow–gorgeous blog! I love this outfit and your style. I'm glad I happened to find you! I'll be following =).Hello, Framboise! Loving the stripes under the denim! great outfit!